Help a swineherd find his prized pig. 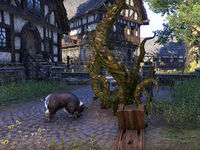 Glutton, the prized pig that belongs to the Daggerfall swineherd Wickton, is missing. Wickton suspects pig thieves, or at least one particular pig thief. To start this quest talk to Swineherd Wickton; he's to the southwest of The Rosy Lion inn. He tells you that Gregoire Lafont Stole his prized pig. He asks you to find his pig so start by going to the Rosy Lion inn which is just to the northeast of where you're at. Go inside and talk to Gregoire Lafont who is standing behind the counter. He tells you that Glutton is probably in the alleys again and says to check the alleys in the northeast section of the city. Leave the inn and go east from the entrance when you pass pigs inside of a wooden fence turn northeast and head down the street next to the houses. You'll find Glutton against the east wall next to a dead body and some vines poking out of the ground. Speak to the pig; after you do that you'll be attacked by a Bloodthorn Assassin. Kill him and go back to Swineherd Wickton and he'll tell you to talk to Zhagush gro-Korlag about the vines. Head south from Wickton's location and talk to Zhagush outside of the Mages Guild. He'll tell you that the vines are connected to the Bloodthorn Cult and gives you a reward. This page was last modified on 6 December 2017, at 22:43.